There are many reasons to implement a collaborative robot or “cobot” from Universal Robots. Manufacturers love their flexibility and ease-of-use, and that they provide the fastest payback in the industry at only 195 days. But cobots from Universal Robots continue to bring significant value for years to come—long after that initial payback period. A survey of our users reveals that despite being put through heavy duty cycles year after year, the cobots are still running strong, in applications that include pick-and-place, gluing, welding and assembly, and machine-tending. “We just achieved the one millionth part out of our UR5 cell in less than a year. The accuracy and repeatability over time was a big concern for us. We were apprehensive, questioning whether we could put the robot through this kind of duty cycle in a high-volume cell and get year-after-year repeatability. We spot check the robot every few months to make sure the axes are performing and it is as good today as a year ago when we turned the cell on. “Six years after we bought our first robot, it is still in operation 14 hours a day, feeding pieces into a lathe, a cutter and a washing machine. The robot has had two joint replacements over the years, but we keep extra joints in stock and can easily exchange the joint by ourselves. Our UR5 has proven to be an incredibly stable robot. We have not experienced any downtime with it despite putting it through high duty cycles for so many years. “We bought the third robot Universal Robots ever sold. This was back in 2009 when the company just consisted of four people and the CTO himself came out to demo it. We have been very pleased with our “old” robot. We have done two joint replacements and just recently got a new screen and controller for it, so it’s still running 8 hours almost every day moving glass pieces from a pallet to a conveyor. 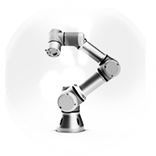 Are you interested in learning more about how to get started up with cobots? You can download our guide "Get started with Cobots in 10 easy steps"